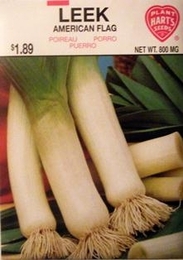 Leek is a mildly flavored member of the Onion family and is very desirable for flavoring soups and stews. Cultivate and draw up earth well around plants so they are fairly well covered at all times. Water regularly and fertilize every 4 to 6 weeks. 4lbs of Leek seed needed per acre.